Atrial fibrillation (AF) is the most commonly encountered sustained arrhythmia in man . A number of conditions are associated with the development of AF, including cardiac surgery. The incidence of AF after cardiac surgery, however, far exceeds the incidence of AF in the general population, or in patients with ischernic heart disease [2,3,4]. 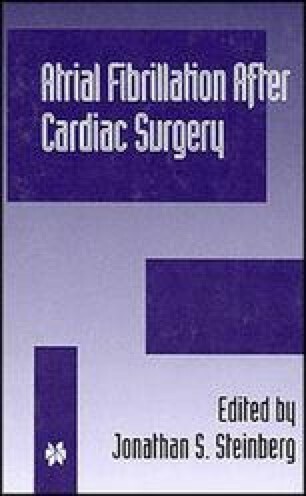 In this chapter, anatomic and pathophysiologic factors associated with AF will be explored, with particular consideration to those relevant to cardiac surgery.